Header photo: Kim (right) picks up Donna (left). Thus, it is all the more thoughtful when someone takes the effort to go out of their way during the dead of winter. This is what Kim Burnham did for a customer at Choice Financial, one snowy day. Kim is an Insurance Manager at Choice Financial in Langdon, North Dakota. Her customer was Donna, a 64-year old woman approaching her 65th birthday, and looking to get her Medicare coverage. Donna is forced to spend most of her time at home due to some health issues; something she’s dealt with her whole life. Because of this, she’s never had a driver’s license. Ever since her son graduated and moved away, she has depended on the kindness of her community for transportation. Donna was on the phone with Kim just before her birthday, and they talked about scheduling a meeting to figure out Donna’s Medicare application. Driving conditions were less than ideal that day. The temperature was below zero, and the weather was windy and icy. So Kim bundled up, started her vehicle, waited for the engine to warm up, scraped off the snow, and drove to Donna’s house — all with a joyful smile. Donna was relieved when Kim arrived. Because of her help, the two were able to set up her insurance on the spot and get all of Donna’s questions answered. Kim has developed a name for herself as the go-to person when someone needs help. This is the reputation Kim has in the Langdon community, Kathy said. Older folks often have questions or frustrations with the paperwork involved with different insurance policies. Kim has developed a name for herself as the go-to person when someone needs help. She studies the paperwork carefully so she can best help each person. She goes through each question, she explains the answers patiently and clearly, and she often saves the customer a lot of money. “Sometimes, they’re not even Choice customers!” Kathy added. That’s because it’s not just a Choice thing for Kim. It’s a people thing. 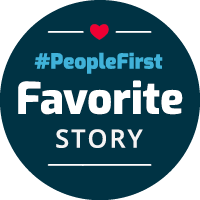 It’s about putting PeopleFirst.